Today's image is a tree trunk close-up of a bonsai in the Marie Selby Garden in Florida. I am always on the look-out for bonsai. They are such works of art. With the small size, one can see details that aren't apparent in the full-size specimen, and the details on the bark demonstrate this wonderfully. 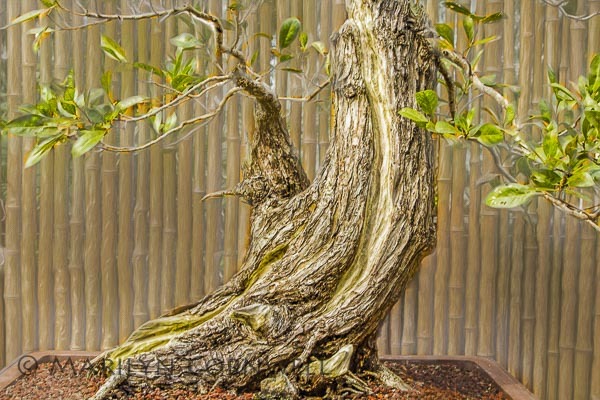 This bonsai is fulfilling its purpose: for the viewer it is contemplation and the grower it is the pleasant exercise of effort and ingenuity. The Beauty of Bonsai Gallery, on redbubble, is the second set of images.